When a man understands the art of seeing, he can trace the spirit of an age and the features of a king even in the knocker on a door, wrote Victor Hugo in The Hunchback of Notre Dame. That’s a very tall order. But we all attempt it, at the Hampi complex, Sistine Chapel, Taj Mahal, Blue Mosque … . We are filled with wonder at our ancestors, at masterstrokes undefeated by time. 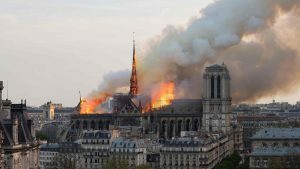 The grief that is pouring in from across the world after Notre Dame cathedral’s ravaging by fire is a measure of the awe it inspired among visitors – 12 million a year. Some felt divinity here, others a secular mystery, few were left unmoved. If the world is feeling hurt that’s nothing to France’s agony. This is ‘point zero’ in the country, to and from which all distances are measured. When the cathedral’s spire fell to the flames, citizens said it seared their hearts. Even as the smell of smoke lessens the Paris skyline remains broken. This is where the coronation of Napoleon and the canonisation of Joan of Arc took place. Here a special mass celebrated the liberation from the Nazis and the bell named Emmanuel was rung to mark the tragedy of 9/11. This is where France came to cheer or to mourn. Where will the country turn to mourn the cathedral ? But Notre Dame may rise again to glory. In its 850 years’ history it has seen desecration and reconstruction before. French President Emmanuel Macron has vowed to rebuild the “epicentre of our life”. Some of the country’s richest families are pledging hundreds of millions of euros for this effort. Citizens of other countries are telling their governments to help. Together there is a promise of resurrection.